Be passionate. Be beautiful. Be independent. Be happy. Most importantly be you. 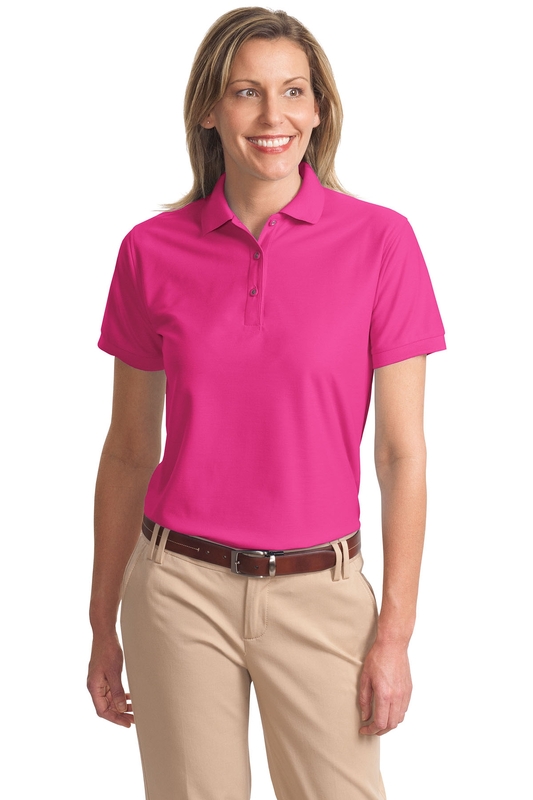 Port Authority Ladies’ Silk Touch Polo represents women who love to express their individuality. We encourage women to be strong, independent and influential. Does this list sound like the women that inspire to be? If it does, then keep reading. Port Authority Ladies Silk Touch Polo is the item that is right for you and is essential to your wardrobe. With a classic style which is anything but simple the Port Authority Ladies Silk Touch Polo proves to be a fans favourite season after season and year after year. You can see why. A perfect fit for a lady of any shape or size ensures you’ll be feeling beautiful wearing this top. To use the top to full effect you can wear it tucked in or tucked out, leaving onlookers see you change from a classy business lady to cool sporty chick in a matter of seconds. The tee is perfect for any occasion, casual, uniform or active. It is ideal for a business who wants all employees dressed appropriately in a faultless outfit. Perhaps, you’re a school or college going on a trip and you want to represent aptly and universally in the colours of the college or school. The classic Polo comes in an immense colour range; Banana, Bark, Black, Bright Lavender, Burgundy, Clover Green, Coffee Bean, Cool Grey, Court Green, Dark Green, Deep Berry, Eggplant, Gold, Hibiscus, Kelly Green, Light Blue, Light Pink, Light Stone, Lime, Maroon, Maui blue, Mediterranean Blue, Mint Green, Navy, Orange, Purple, Red, Royal, Steel Grey, Stone, Strong Blue, Teal Green, Texas Orange, Tropical Pink, Ultramarine Blue and White. This colour range covers every colour group, which leaves the essential Polo perfect for any organisation, whatever your unique brand colour may be. The Polo weighs 5 ounces, and is made with a 65/35 polyester and cotton blend. The style includes a flat knife collar and cuffs, and two metal buttons with plastic edges that are dyed to match the thread color. Other features of this style include double-needed armhole seams and hem, as well as side vents, making the Port Authority Polo a breathable pullover made for both indoor and outdoor wear. Adult sizes range from Extra Small to 6 Extra Large, accommodating any size and body type. We are not just looking to make a top that fits your body; we provide a top that fits your character and lifestyle. If you are a woman who looks to express your individuality, express it with the Port Authority Ladies Silk Touch Polo.